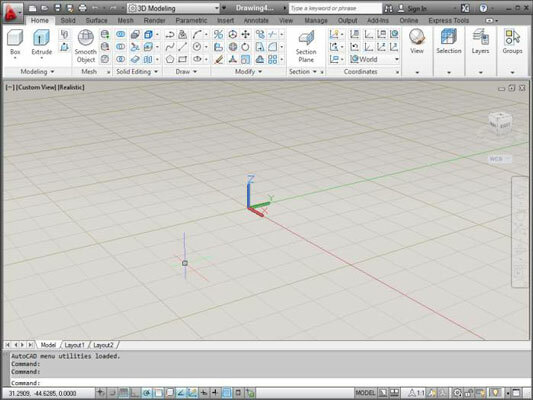 Open the Workspaces drop-down list on the Quick Access toolbar, or click the Workspace Switching button on the status bar and then choose 3D Modeling. Toolbars, palettes, and Ribbon panels flash on and off, and soon AutoCAD settles down to display the Ribbon, as configured for the 3D Modeling workspace with a few additional panels. Click the Application button and choose New; then click Drawing. Choose acad3d.dwt if you’re working in imperial units or acadiso3d.dwt if you’re working in metric. Click Open. A 3D modeling space appears where, rather than look straight down at the drawing area, you look at it at an angle from above. To switch from 3D to the 2D world, simply click the Workspace Switch button on the status bar and choose Drafting and Annotation.